^ You are very right..but Mythos is a classic...even if it does get crappier and crappier each time you visit...its still cool each time you go..I wouldn't want to see Mythos go. Location: Within 5 hours radius from 70+ roller coasters! Blue Man Theater - Concept Images and Details release! I was working on the web and then I notice I got an email from Universal Studio and GUESS WHAT! BLUE MAN GROUP VENUE... Concept images and details was release! I'm pumped to go this christmas! Orlando, Fla. – Blue Man Group, the wildly successful live entertainment experience, will perform from a specially created theater at Universal Studios theme park starting June 7. Universal’s Sound Stage 18 is being re-designed as a 1,000-seat theater complete with its own box office, and will be accessible from both Universal CityWalk and Universal Studios theme park. The re-design includes a stunning exterior as well as interior features specially designed for the Blue Man experience. 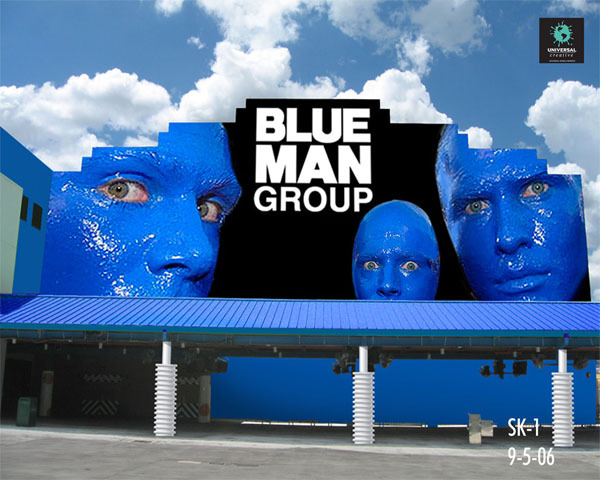 On the outside, 30-foot-tall Blue Men – the largest Blue Man images ever created - mark the entrance to the new theater. Their size makes them visible from nearly everywhere inside Universal’s CityWalk. And inside, there is a set design that has evolved from the original New York production, still running at the Astor Place Theatre. Its purpose: to create an environment for the Blue Man character to connect with the audience in a visceral way. The Blue Man Group Band, a live presence in all Blue Man Group shows, will hover above the stage in two loft-like boxes. The lofts are connected to the rest of the space with a series of large pipes - similar to the pipes the Blue Man Group uses as part of its unique instruments. The pipes supplement the theater’s audio system and allow the band’s sound to reach audience members in a unique way. Video has been an important part of Blue Man Group since the beginning and the Orlando show will be no exception. In addition to the main screen on the stage, which conveys most of the show’s video imagery, the theater’s sophisticated video system uses the entire set as a projection surface. The set becomes a giant canvas which the Blue Man uses to connect with the audience. Audio visual veterans at Scharff-Weisberg designed the video system which will be used in the new theater. The new technology, already in use on the “How To Be a Megastar Tour 2.0,” allows for the video elements of the show to be integrated with and controlled by the lighting system. 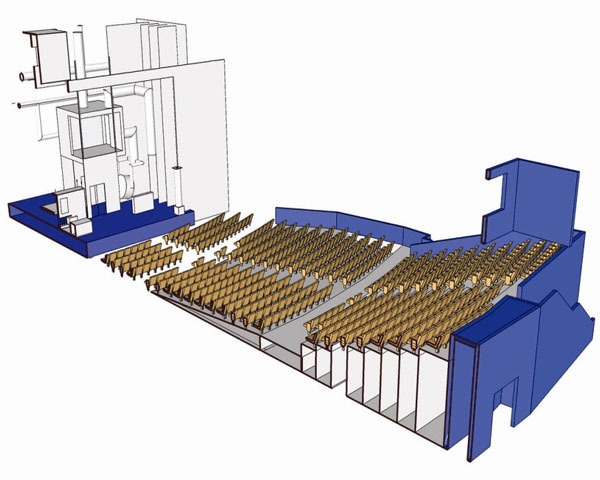 The new theater will have orchestra seating throughout, maintaining an intimate setting that allows all audience members to feel close to the action onstage. The seating design also provides comfortable seating and excellent sightlines in every seat. The “poncho” section, as it is playfully called, will be located in the front of the house and will provide a more up close and personal experience for guests who don’t mind the possibility of getting splashed by the Blue Men as they perform. A lobby area is also being created with concession, retail and event space. The renovation of Sound Stage 18 also includes the installation of a new entrance through CityWalk, allowing guests to access the theatre without purchasing a theme park ticket. Tickets for the new show are on sale now, with opening night set for June 7. Contact the Universal Orlando ticket line at 888-340-5476 or visit www.universalorlando.com for more information. I hope the stadium doesn't feel as claustrophobic as it looks! But I'm sure the BMG show will be awesome. Can not wait to see it. If the donkey is rockin, don't come knockin! ^I wouldn't be worried about that, it REALLY helps the show. The theatre in Chicago is in a very small building but when you get inside it doesn't feel very small at all, and it really does add to the personal affect of the show. ^^I heard there will still be a walkway from the Hard Rock Cafe to USF, but it will be in a different location. The old one is still open until the new one is finished. ^^^ It shouldn't be too bad if the release is true in announcing that this theater is modeled mainly after the Astor Plaza show in New York. The theater there had only one flaw- a second level seating that came over the back half of the first level, causing for anyone sitting behind row 10 to lack a view of the entire stage (at least the top half). It seems from this concept art that this has been fixed with the use of elevated seating not overlapping past the boundary of the level rows. I will know more on opening night but my seat is more towards the front (middle of row 7 to be more precise)-out of the poncho section and section 1 but in the first row of section 2. What's with the donkeys anyway? yeah... I agree. It shouldn't be that claustrophobic, besides it seems this picture is only half of the stage, like they cut it in half to show you the details. It doesn't look so small since it is purely slice in half what it appear to me as well. I'm actually looking forward to this. From the Press Release, it said 1,000 seats so that cover more than the gym floors space in the basketball arena alone. It is not bad the way I see it. Anyway... I'm pumped! JediMaster... Hope you can keep us posted with pictures and your experience at the opening night! Also.... May the force be with you... ALWAYS! "It's not small, but it is very 'average.'" ^^^How many times are you going to mention that you have tickets for opening night?